I popped into the shelter on Saturday to say hello to our friend Sarah who was covering a shift in Vet Treatment. While I was in there, I spied these five cuties in a cage. I really wasn't planning on picking up any kittens just yet, but how on earth could I ever say no to these five cuties?? I have a weakness for Tabbies. And they were pawing at me from their cage. I just couldn't leave without them. So, they boxed them all up for me, and the Winklers moved in. The Winklers aren't so wee. They are all close to making weight, so their visit should be brief. They are pretty dang sweet already so we won't have to spend too much time socializing them. A few of them came in with goopy eyes, so mostly they just need a little time to get that all cleared up. The meds are working wonders already, and their eyes are looking good. Welcome Winklers! We're so excited to be hosting this Tabby pack!!! Stay tuned - later today we will start with the formal introductions. oh my they are cuuuuuuuuuuute! My stars! Little stripey jackets! You're not kidding when you say they're big. That's a good sign, though. Aww! They are so Cute I especially like the one on the right side end. she/he is beautiful! OMC ~ or should that be OhMyKitten? They are TABBYLISHUS! Adorable! My heart has a special little space for tabbies. This handsome bunch is no exception. My orange stripy man, Bubba, agrees - he's checking out the pictures over my shoulder. Totally Tabulous!!! And seriously, you have them days and yet they all line up for you and pose pretty - you are a real kitten whisperer, which makes sense since your Dad is too. Welcome to the cyber-world wee Winklers. Arent you just the sweetest things! Your lives will be wonderful with loving homes in your future. Laurie, Craig and Beanie are on the case. Can't wait til they are finished quarantine - kitten mayhem for sure. The next to last one on the right looks just like my Lily did as a wee kitten. If I did not have Mr. Em and Mr. Fen I would be making a call right now. These tabbies are adorable! What a cute bunch! And yes, they really look big, especially compared to the Lamms -- they look like they're about the same size as the Lamms were when they left! 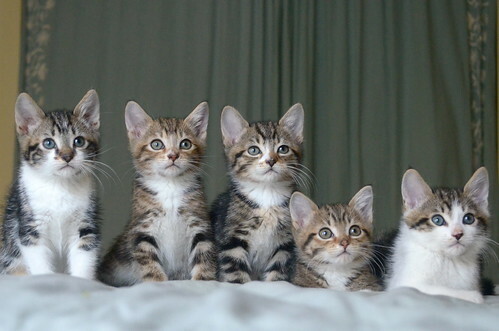 I'll bet your kitten room is going to be bouncing with this bunch in quarantine in there. And yes, how DO you get a family photo just days after bringing them home? You truly have miraculous talents at kitten photography. Seriously! They have the sweetest little faces. I second that remark! I was envious about walking thru a rescue only to say "I'll take all five of them." Kittens for carry-in. I hope one of them is named Willie........... They are VERY CUTE! They all look so serious! Not to worry wonderful little Winklers - you have won the Kitten Jackpot! Tabby cats always look serious! The one on the right reminds me of two cats I had/have. I hope it's a boy. Sarge Winkler or Opus Winkler would be nice names don't you think? I am new to your website, and I have fallen in love with all your babies! I really admire you for all your efforts to save these little ones, and give them a second chance at a happy life. I worked with our local Humane Society, and my husband and I fostered a total of six kittens and one dog. We wound up keeping all of them. I am in awe of you, that you can prep them for adoption, and not be tempted to keep them! Thank you for your limitless compassion! Thanks for the kind words. You're not alone. There are many "foster failures" out there. Truth be told, I think that's part of the reason shelters need foster families - to adopt. 5 tabbies?! Hurray! 2 of mine are tabbies. I have a soft spot for them as they're often overlooked for the more 'exotic' looking kitties. Tabby Fever! O my goodness!!! Ohhhh, give me the two with the lovely arm bracelets!! Every kitty I've ever had has been a brown or brown-and-white tabby boy. Never went looking for a brown tabby on purpose - it just seems like those were always the kitties destined for me. These ones all have excellent face-stripes. :) My boys are proud. so so so very cute!!! I hopo one is named Henry or Fonz. Stunningly striped and Precious! What a group. How did you get the last name, Winkler? They were winky when I met them. Hi Babies! You're all just so cute and I bet you're going to make some lucky families very happy! "They boxed them all up for me." That made me laugh out loud!